The Bikeshop-Scott-Strocam pair blitzed the tough 88km course in a time of 3:40:49 to beat Jason Peach and Jason Read and Renay Groustra and Stuart Marais (RSA Web) to the finish at the Zuurberg Mountain Village outside Port Elizabeth. Overnight leaders Andrew Hill and Shaun-Nick Bester (TIB-Silverback-Best4Sport), who set the early pace, suffered a serious mechanical before the first water point and later a puncture to cross the line in fourth. They were able to maintain their lead in the general classification, but their nine-minute cushion was slashed to two seconds over the Plett riders – setting up a thrilling grand finale. Peach and Reed are third overall, just under three minutes off the pace. Connelly, 19, said he and his 20-year-old teammate were thrilled with the outcome, even though it “was completely unexpected”. He said their game plan was to try and stick with the leaders “until we blow”. 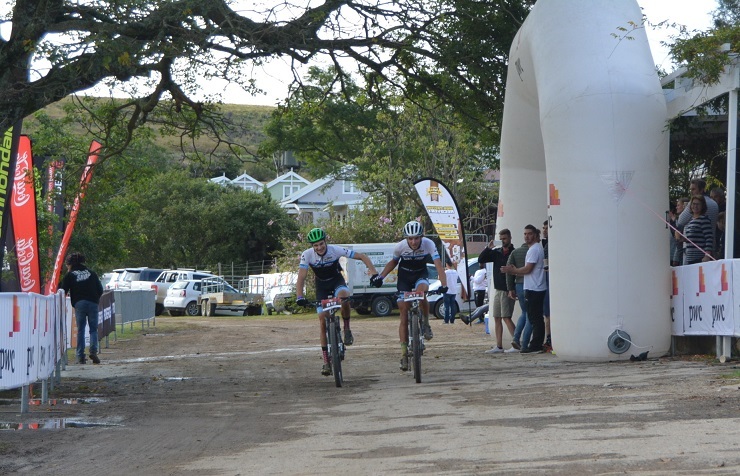 Hill and Bester broke away to take an early lead until they suffered their mechanical, which allowed a number of teams to pass them at the first water point. “At that point we formed a group in front with Jason and Renay and Reinhard [Zellhuber] and Marc [Fourie],” he explained, while Reed and Peach caught them later. The four teams stuck together for a large part of the stage until Reed and Peach gapped their breakaway companions on the way down Gower’s Gauntlet with about 25km to go. They were eventually reeled in and dropped by Connelly and Smart with 14km left. “Once we managed to overtake them we put our heads down and time-trialled to the finish,” said Connelly, admitting they did not know what to expect in their maiden appearance at the PwC Great Zuurberg Trek. “We weren’t really thinking of a stage win and are just tackling each challenge as it presents itself. He said they would take the same approach into tomorrow’s final stage over a relatively short but tricky 50km. “Today’s queen stage definitely lived up to its name. It was super tough and I had some cramps towards the end. “But we will go through our normal recovery process and just see what happens tomorrow. Swiss ace Ariane Luthi and Robyn de Groot (Ascendis Health-Spur) extended their overall lead in the women’s section after getting the better of Theresa Ralph and Sarah Hill (Galileo Risk). De Groot, from George, said they were able to keep a nice tempo on what turned out to be a testing day. “There was a lot of hard work during today’s stage and not many easy sections. Neill Ungerer and Yolande de Villiers (Silverback Bikes) won their second stage in the mixed category to take a commanding lead in the overall standings. They were followed home by Ben Melt Swanepoel and Yolandi du Toit (Garmin) and Nicholas Webb and Kylie Hanekom (Bike Hub).